(June 20): Globally, equity markets have remained remarkably resilient despite the recent increase in geopolitical risks and related uncertainties. Notably, the US market — the key barometer for global investors — is near record highs, extending a rally that started in early 2009. Every correction since then has been short and shallow. Furthermore, the Volatility Index (VIX), which measures the volatility for the Standard & Poor’s 500, is now at 20-year lows (see Chart 1). This suggests that market participants are either overly complacent or pricing in low volatility ahead. These observations in combination have resulted in a slew of narratives that suggest that market valuations and risks are reaching dangerous levels — and that a major correction (perhaps even a crash) may be imminent. 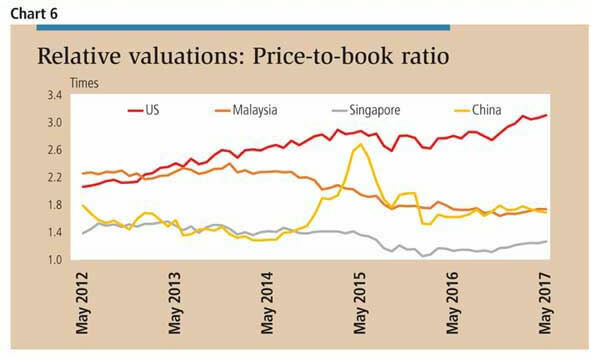 Are markets excessively priced? Let’s start with the facts. Charts 2 to 6 paint a rather interesting picture of divergence. 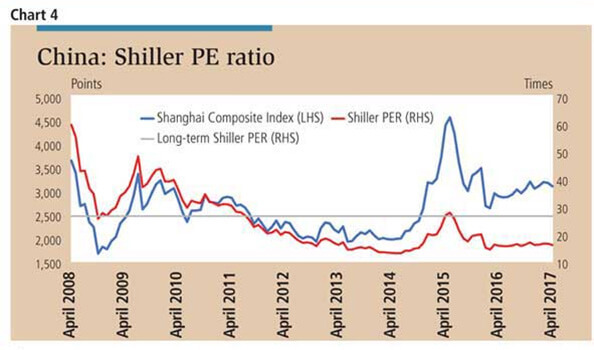 The commentaries are right in that the US market does indeed look pricey, with the prevailing Shiller price-toearnings ratio well above its longterm average and price-to-book valuations at the highest level in five years. However, this is not the case for the rest of the world. Developed markets such as Germany and Japan still look reasonably valued, while Singapore and emerging markets, including Malaysia and China, actually appear undervalued. The world economic recovery has been anaemic since the global financial crisis, despite massive quantitative easing and record-low interest rates. But it is starting to gain traction. The exception is China, where GDP growth is expected to slow. Nevertheless, it is still expanding faster than most. Earnings growth has also turned positive, rebounding from a trough in May 2016. There is a case for optimism, underpinned by factors such as globalisation, technological innovation and digital transformation. I will elaborate further on these next week. In short, there are positive signals for markets. Nevertheless, the potential pitfalls are very significant as well. Here are some of today’s major concerns. The global financial crisis triggered unprecedented responses from central banks. 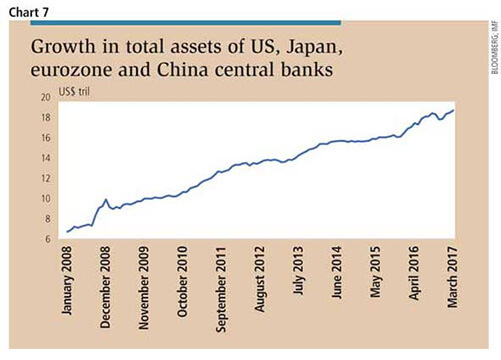 We saw massive quantitative easing in the US, China, Europe and Japan, which created a surge in money supply (see Chart 7) and drove interest rates to near zero, some even into negative territory. Remember, the interest rate is the price of money. And low interest rates justify high valuations, that is, V=E/r. Cheap money encourages financial engineering. We have seen a sharp rise in debt-funded mergers and acquisitions, stock buybacks and higher dividends — all of which have justified higher stock prices. Meanwhile, massive bond buying by central banks reduced market supply and boosted prices. When bond and equity markets worldwide are driven not so much by underlying earnings improvement and growth but by sheer liquidity, the question is, what will happen when all these reverse? The massive amounts of money poured into cheap passive index- based investments only add to these worries. Again, I will share the reasons next week. For now, bear in mind that, globally, exchange-traded funds have grown into a US$4 trillion (S$5.5 trillion) industry — from just US$807 billion in 2007. Every day, more money managers — especially those who are late to the game — are coming out with their own indexing products. Twenty years ago, there were 8,000 listed companies in the US. Today, that number is closer to 4,000. In other words, there is now a lot more money chasing fewer companies. Another major concern would be the rising debt levels worldwide. According to the Institute of International Finance, gross debt in the global non-financial sector now totals some US$217 trillion, or 325% of GDP. That is three times the level at end-1999. In China, the number is 390% of GDP. Clearly, things are never that clearcut. 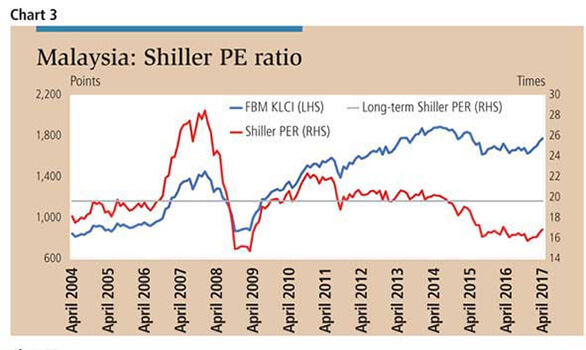 While the past may provide insights, valuation is fundamentally an outlook of the future. 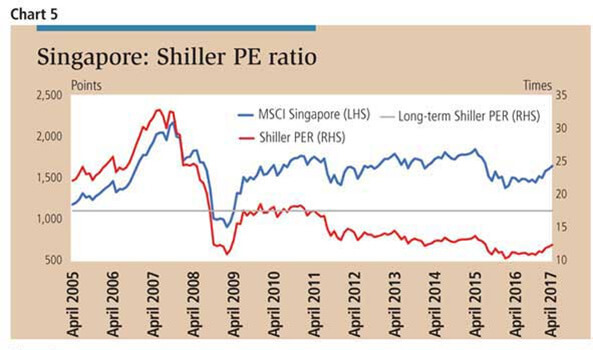 There are factors driving markets and justifications for even higher valuations. At the same time, arguments for a major correction cannot be easily dismissed either. Which will prevail? Don’t forget to pick up a copy of The Edge Singapore next week for more.